The Phix will impress vapers who have been looking for an elegant, closed loop vape that is focused on simplicity. The Phix allows you to enjoy a stylish vaping experience without having to worry too much about the mess that can be created when you are dealing with e-juice and filling tanks. This device features an appealing ceramic finish and it is very comfortable. Thanks to the fact that it comes with a 1.5ml pod already installed in the mod, you won’t need to put up with the hassle of filling the tank and possibly spilling e-liquid all over the place. The pod gives you a 5% nicotine content that is specially made for the MLV Phix. While this is a high amount of Nicotine for those who are not used to vape with nicotine, it may suit heavy vapers who want a strong throat hit. What do you get with the MLV Phix? When you purchase the MLV Phix, you get all the necessary elements to enjoy your vaping experience with this device. The packaging is well-designed and it comes with a transparent panel that allows you to see the mod. There are also some diagrams that explain the main features of the MLV Phix, including the featherweight size and the USB charging. The box includes the mod (which has a beautiful design), one original Tobacco Blend pod in a blister pack, a PHIX battery and USB magnetic charging cable. One of the most noticeable aspects of the Phix is its amazing appearance. It has a futuristic look that will captivate your imagination. It is truly stunning and it will leave you amazed. Once you take the device out of the box, you can see its smooth ceramic built that makes the device comfortable and pleasant to the touch. In addition, there are ceramic coils inside that offer a resistance that ranges between 1.4 and 1.5 ohms. In order to get started, you just need to open the blister pack and install the pod into the device. The pod attaches magnetically with a simple click and then you can start using the Phix. Once you start pulling, the device will be activated. It is not only beautiful, but it also offers ease of use. The magnetic charger ensures that the device remains in place, but it is not possible to charge the Phix while you are vaping. The battery provides a decent 280 mAh, which means that you can get about 220 puffs per charge. You get an Original Tobacco flavor cartridge, but if you want to try other options, MLV offers replacement cartridges in a 4-pack. You can get other flavors like Spearmint, Butterscotch, Strawberry and Ice, which is very similar to Menthol. Who is the Phix for? The Phix is a convenient device that will allow smokers to make the transition to vaping without major hassle. It is a simple solution that deliver good vapor production, although it may be a bit underwhelming for experienced vapers who want a more powerful experience. Still, the tobacco flavors offers a semi intense throat hit that offers a good balance between smooth and strong. The more you draw, the more intense the flavor will get. In addition, the LED indicator light in the middle of the device lights up whenever you take a hit. However, it is not activated when the device has to be charged, which is a downside. MLV focuses on creating juices for these cartridges and they have a salt-based nicotine inside. Although there is not a wide range of flavors to choose from, the ones available are very enjoyable. 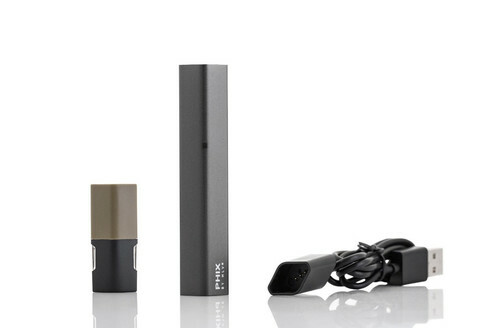 Another option that you can consider if you are looking for a closed loop, pod mod like the Phix, is the Juul, a device that also delivers 5% of nicotine for its pods. Just keep in mind that the Phix offers more capacity for e-juice since the Juul is smaller. Still, the smaller size also means that it is more discreet and portable. That being said, the larger size and increased e-juice capacity of the Phix mean that it can be held easily and it offers a vaping experience that lasts longer. Let’s start with the best things about the MLV Phix. First of all, the device looks great and you can hold it without issues. It offers a great feeling and it is comfortable. 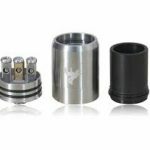 Now, when it comes to the downsides, it should be said that while there are no major issues with the Phix, there are certain things that are likely to bother some vapers. One of them is the fact that there are no other pods available. It is only possible to use the pods that MLV offers for this device. This means that if you prefer a large variety of e-juices, you may be disappointed. In addition, it is not possible to charge and vape at the same time. The Phix doesn’t give you flexibility to make any modification or implement any hacks to take the device to the next level. Plus, the replacement cartridges are a bit expensive. If you are looking for a practical solution that saves you the hassle of filling the tank and possibly facing spillage, the MLV Phix vape is probably what you need. Although it comes with drawbacks, these aren’t bad enough to spoil your experience with the device. The Phix is an investment that is worth considering since it offers high quality and it looks great. Compared to its closest rival, the Juul, the Phix is a better choice and it is likely to become the favorite device for many people. It is portable and it offers a great feeling. You can start using it easily and the magnetic cartridges snap into one place as you start taking draws to activate it.